The walls around me are mostly white, made of blocks – clinical but with an underlying menace, not unlike the wipe-clean tiles of a dental surgery. This a puzzle chamber, one in a series of them, with elevators taking me between each one. But GLaDOS is nowhere to be seen and it seems Chell has finally found her voice. Oh wait, hold on, I forgot again: this is not Portal 3. 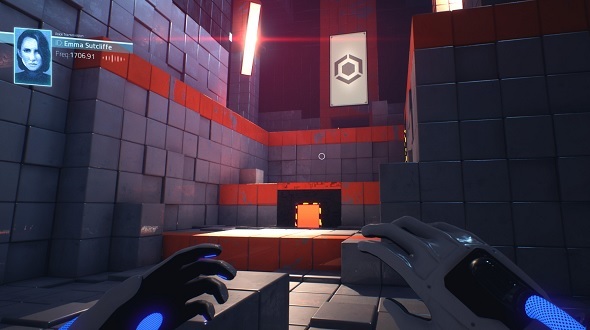 Find out how the developers pieced together the puzzle design of Q.U.B.E. 2. Fans of Valve’s devilishly smart first-person puzzle series have been waiting years for a third game. We thought it was going to emerge in 2017 but that turned out to be an unexpected spin-off. And while Valve say they are returning to making games there is not much point holding out for Portal 3. In the meantime, however, there is Q.U.B.E. 2, which finds another way to deploy these kinds of enclosed puzzle spaces, one that is both fresh and familiar. You take on the role of Amelia Cross, an archaeologist stranded inside an ancient monolithic structure on an alien planet. Instead of a portal gun you are given gloves which allow you to manipulate certain cubes in the environment. 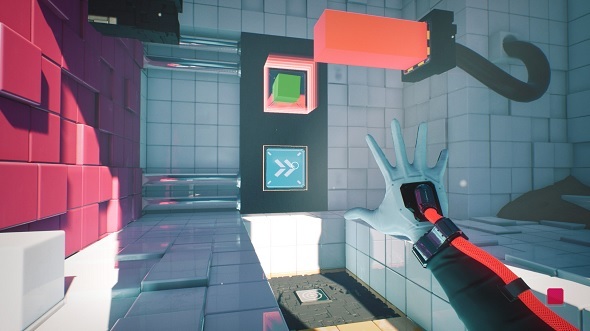 The key to the puzzle design is the limitations of these gloves – only one of each colour cube can be active at any one time. To succeed, you have to look to the fans, magnets, and other contraptions – such as movable platforms – that hide in plain sight. Generating a block that needs to be magnetised, stood on, and then shot across a room with you on it, feels like you are breaking the game’s rules, stepping outside of the approved boundaries. Just as in Portal, the game’s designers are always one step ahead of you but never let it seem that way. You might rotate a platform in order to ascend up the level, then find yourself at the highest point with no way to traverse a gap. A little head scratching later you’ll realise that the platform you moved a second ago, and forgot about, is also meant to act as a bridge. These are the kinds of solutions that shouldn’tbe solutions, which make you feel like you have discovered something which nobody thought about before you did. Like Chell’s, Amelia’s journey through the structure is more than an escape – there is a larger truth she needs to uncover. She is not alone, either. While Portal had the mocking voice of GLaDOS to tell its story, Q.U.B.E. 2 has Amelia communicate with another survivor, a commander named Emma. You hear from Emma in bursts, as her communication device falters on occasion, but she is always encouraging and helps Amelia to delve further into the mysteries of the planet. Even so, if I’m honest, I do not trust Emma. Not after the whole Wheatley fiasco. The threat in Q.U.B.E. 2 is much less obvious than it is in the Portal games. There are no turrets, no toxic water, and no platforms that have spikes or can crush you. Occasionally, however, Amelia will come across a statue in a red-lit room which, when investigated, will play a short, jumbled transmission. Different voices, scrambled parts of a sentence, all sound together to make an ominous statement. What is the truth behind this ever-changing planet? 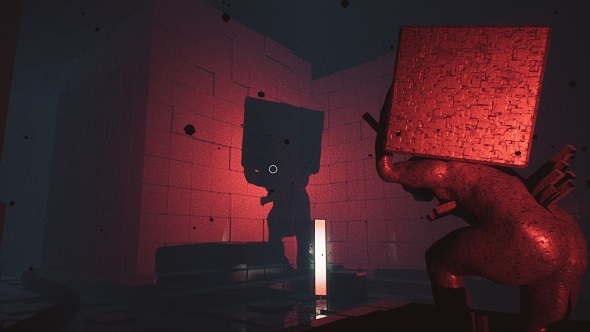 The game’s drip-fed mystery is a welcome break from all that hard work solving puzzles, and helps to motivate you when you come up against any brick walls along the way. The story is helped along further by the characters in Q.U.B.E. 2 being more visible than they are in Portal. With Amelia and Emma’s faces on show in the game’s opening, when they first communicate, you can establish a connection with them straight away. It makes it easier, over time, to care about their shared plight. You are given a reminder of the body you inhabit by Amelia’s hands, too, which are nearly always on screen, hovering in front of her face like little raptor claws. Occasionally, she flexes her hands, and she will stretch – it must be a pretty uncomfortable position to keep your hands in, to be fair. As silly as picturing her posture might be, it makes for a more human perspective than staring down the barrel of a gun. Q.U.B.E. 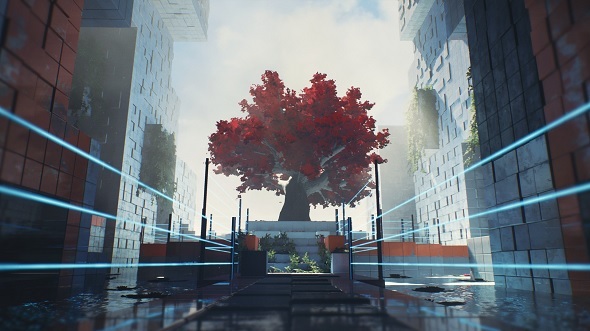 2 takes the first-person puzzler in a direction I can only hope Portal 3 might someday go. You are no longer confined to claustrophobic, subterranean chambers, and will catch regular glimpses of the sky, the sunlight casting angular shadows behind all of those cubes. I even found a tree at one point. The magic and beauty of the experience helps to create a serene set of spaces that do the same job of relieving the more intense parts of puzzle solving that Portal’s jokes do. Sure, you are still confined, penned in by fences, doors only opening when it is time. But there is a sense of a wider world beyond these puzzle rooms. Aperture Science aren’t the only players in the business.